Running a cat sitting and grooming company I see many clients who do not understand the correct play toys to buy their cats, and that’s if the cat has any toys at all!! Some clients tell me their cats do not play and yet, when I bring the correct toys around, and take the time to stimulate a play session the cat, 99% of the time, WILL play. If you allow your cat to sleep all day every day it will. Simple as that. An in-door cat will sleep that amount of time because of boredom and lack of stimulation from their owners. We can’t argue with the fact that a cats natural instinct is to kill prey and enjoy the hunting process. If you have an outdoor cat the hunting side of him/her will be activated and enjoyed to the full. But what of in-door cats who may be bored or have pent up energy with no outlet. I have found that the best toy on the market is the Da Bird feather toy which mimics hunting to the max. Any toys with real feathers attached to string or wire give the correct motion of bird wings fluttering which of course will get your cats heart fluttering, in excitement!! There is also The cat Catcher Mouse which is great because the mouse resembles the size your cats real prey would be and the wire creates the movement of a real mouse. Don’t just thrust toys into your cats face as this is annoying. Make it interesting by hiding your toy under loose newspapers and moving it around or under a rug or carpet. This may sound silly saying that some people don’t know how to play with their cat but the whole point of play therapy and mimicking hunting is to make the game interesting and close to what prey would do which is hide, keep still, move a little – scurry under the sofa or a newspaper (scattered around on the floor) or a cardboard box…get the picture? Leaving toys scattered around on the floor and letting your cat get on with it is BORING and will send your cat to sleep! Another great toy is a laser light. You don’t need to spend much. Most can be picked up really cheaply. Never shine into the cats eyes, but I am sure you know that already.. right? Care about your cat and understand how your cat sees the world and the home it lives in. 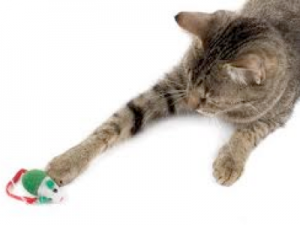 Be kind to your in-door cat with lots of stimulation with the CORRECT toys! !